On 6th August 1944, United States Army Air Force 2nd Lieutenant James E Matuska crash landed De Havilland Mosquito NS557 at RAF Langford Lodge, Co. Antrim. De Havilland Mosquito NS557 crash landed at RAF Langford Lodge, Co. Antrim on 6th August 1944. Built on 17th March 1943 at the De Havilland factory and aerodrome in Hatfield, Hertfordshire, the Mk-16 used Merlin 72/73 or 76/77 engines. The USAAF in the United Kingdom took delivery of the plane after 24th March 1943. Imperial War Museum Photo: TR 1426 (Part of the Ministry Of Information Second World War Colour Transparency Collection). 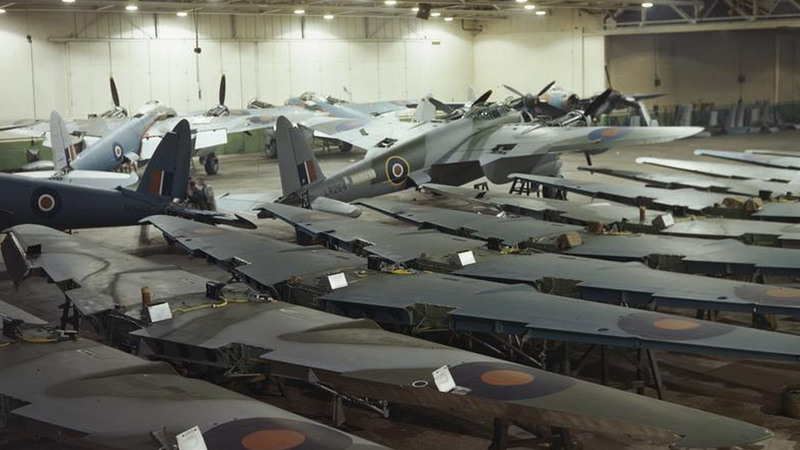 De Havilland Mosquito planes at various stages of construction at the De Havilland plant at Hatfield, Hertfordshire, United Kingdom. Photo taken by British Official Photographer. The pilot was 2nd Lieutenant James E Matuska, serving with 8th Weather Reconnaissance Squadron, 802nd Reconnaissance Group. He was flying out of RAF Watton, Norfolk, United Kingdom. An unknown navigator was also on board at the time of the crash landing at the Co. Antrim airfield. United States Army Air Force recovered the damaged plane, loading it onto a truck at Langford Lodge on 6th August 1944. Two federal C2 wreckers loaded the stricken craft to allow transportation for inspection. One of the undercarriage legs became detached from the plane during the crash. The United States Army Air Force struck off De Havilland Mosquito NS557 on 28th August 1944. If you enjoyed this post on "De Havilland Mosquito NS557 crash at Langford Lodge, Co. Antrim", please share with your friends and followers.